A vibratory feeder, also known as a vibratory conveyor, is a type of equipment that uses vibrations to transport bulk material through stages of a particular process, like packaging, recycling, or finishing. Vibratory conveying differs from standard belt, screw, and pneumatic conveying in that it can handle sticky or delicate materials without damaging them or causing them to liquefy. Vibratory feeders are ideal machines to use for material handling as they are low-maintenance, and the only moving part it contains is a vibrating drive located underneath the feeder pan and out of the way of any materials. 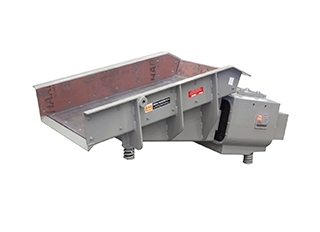 The other parts of a vibratory feeder are inexpensive and easy to replace. Vibratory feeders can be powered either electromagnetically or electromechanically, the latter of which is driven by a motor supported by eccentric weights or an eccentric crank. Small parts manufacturers use vibratory bowl feeders extensively for the purpose of efficiently orienting products for distribution or further finishing. Bowl feeders were originally designed by pharmaceutical companies to sort, count, and organize pills. Nowadays, they are also built to work with items such as toothpaste caps, molded rubber parts, o-rings, ammunition, and fasteners. Many industries—such as food processing, agricultural, and pharmaceutical—use vibratory conveyors, screens, and trommels for bulk and powder material handling. 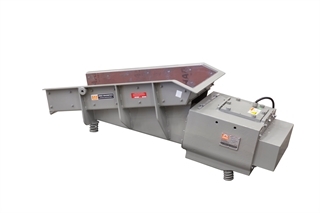 Vibratory conveyors are used frequently in recycling industries to sort and convey numerous materials such as metals, crushed cement, wood, and plastic. Mining, pulp, sand and gravel, and fertilizer companies use vibrating screens and trommel screens to sort, sift, and convey their materials. 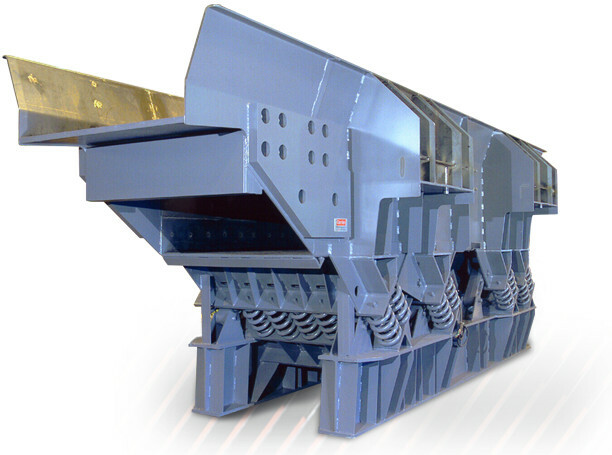 A grizzly screen is a powerful type of vibrating screen which is most frequently used in the mining industry. Vibratory conveyor systems usually work together with rotary airlock feeders when they must convey powder bulk solids. In the processes of reclamation or collecting dust, rotary feeders and dust collecting systems are used together. Bowl feeders are similar to vibratory finishing bowls, and are made of plastic, silicone, or metal. These machines are equipped with a vibrating drive that is mounted to the bowl’s base. A ramped ridge—which is typically designed for a specific part—leads to the outfeed area, and runs up along the bowl’s edge in a spiral. The bowl, which vibrates in a circular motion, moves the parts up the spiral ridge. As it reaches the output area, it narrows and forces the parts to form a single-file line. Small parts such as coins, legos, o-rings, and washers can easily be aligned for packaging and counting when they are dumped into the bowl feeder’s center. Vibratory conveyors vibrate in one direction, and they move heterogenous mixtures or powder bulk solids from one piece of equipment to the next. Some varieties of these vibratory conveyors have ultra-low vibrations for the purpose of handling solids such as lettuce or gummy bears which are sticky, delicate, or prone to liquefy. Trommels, or trommel screens, are vibrating screens which separate small and large particles. Rotary trommels are used in recycling and the processing of gravel. Trommel magnets help sort ferrous from non-ferrous materials, and are frequently used alongside metal recycling rotary trommels. Continuous flatbed trommels usually have filtering devices or screens that help in sorting particles of varying sizes. Larger particles are conveyed either to be further processed or contained. The incorporation of vibratory feeders into various industrial processes has many benefits. Feeders are highly cost-effective in comparison to manual labor, and therefore can save a company more time and money in labor costs. Instead of one operator per machine, a number of automated machines can be overseen by one operator. Bowl feeders can process small parts more accurately, quickly, and effectively than a worker can do by hand. In addition to saving time and money, it also spares workers strenuous and tedious tasks. Vibratory conveyors are an alternative solution for machines such as belt, screw, or pneumatic conveying, as vibratory conveyors are more capable of handling sticky or friable materials that would otherwise be more likely to agglomerate or cake. Trommel screens and rotary trommels are more capable of efficiently sorting recyclable materials by reducing the labor required to carry out the process.